‘Don’t talk to Strangers’ is practical advice that’s drummed into us for our own safety when we’re children, and the reasons for this don’t need to be questioned. However, as adults, if we want to play with Synchronicity and allow for profound messages to arrive magically in our lives, it’s critical that we learn the art of conversing with strangers, without putting ourselves at risk. When we’re in confined spaces with others, for example in a café, a shop, or a train, it’s part of human nature to glance around at the other people who we share the area with. And sometimes, we’ll spot someone who catches our eye, and maybe we catch their’s at the same moment—and I don’t mean this is in a sexual sense, although of course there are those moments too, but rather when you see someone and maybe they seem familiar, or they just stand out to you as being radiant or intriguing. We might also see that same stranger again during the same day or week; we can deduce that we may be orbiting each other. THE CELESTINE PROPHECY POINTS TO SUCH ENCOUNTERS AS A POSSIBLE SYNCHRONICITY, and that our paths may be crossing for a reason. Once we believe in Synchronicity, and sense that it’s real, we should take these events seriously to ensure that we don’t miss out on exchanging potentially life-changing information. So, if we catch someone’s eye as we sit in a public space, one might wonder how we make the transition from eye contact to conversation, without feeling uneasy or worrying that we’ll come across as a nutcase! Boldness here is key, although of course, whilst processing our desire to talk to someone, we must be mindful of their current activity and body language, so that we don’t negatively interrupt their flow. For example, if you see someone in a restaurant who you happened to notice earlier in your day, say, when you were at a petrol station, there is possible significance to you both being in two of the same places during your day. However, if, when you spot the person they are sitting with their friend, enjoying a meal, I don’t believe it’s polite to try to force yourself into their encounter whilst they are in the middle of their own experience. Conscious, synchronistic conversation should flow easily, and shouldn’t need to start off in any way that could be construed as an abrupt, negative interruption. If you were to waltz over to the side of their table and say, “Hey, I noticed you twice today and I thought maybe we might have a message for each other!” it’s possible your arrival could disturb them, as you have no idea of the depth of the conversation they were sharing, or how much those two people needed that particular chat. No, interrupting someone’s flow so you can talk to them is not the most positive way to start. Rather, be patient and see if an opportunity arises where you wouldn’t be an interruption. Say, for example, they happen to stand next to you when fetching a drink from the bar, or if you both make moves to leave the restaurant at the same time. So, let’s imagine that you’ve found your moment, and the object of your attention is now right in front of you and all you need to do is find some words to say—what happens next? Well, to put them at ease, start off by finding some commonality that you’re sharing, just to get the words flowing between you. Even the weather will do as a starting point. Only two things are going to happen from here, either they’re going to excuse themselves from your conversation, or they’re going to carry on giving you their attention. If they walk away, that’s fine, you’ve done no harm and you can carry on with your day with no hard feelings. But if they continue talking to you, and seem interested, you can swiftly ask them anything that you think may be pertinent to uncovering the synchronicity. Remember that you may have information they require, so you may be meeting so that you can give them advice rather than the other way around. If you ask a question about their life, keep in mind that people will be naturally cautious about giving you any of their personal information, so avoid specifics such as asking where they live or work—it will only place them on the back-foot, as they try to deduce if there is any need for them to worry about you seeking personal information. If you both feel like you should keep in touch after your encounter, then make sure you take your own safety seriously, don’t share too much personal information—ie. giving them your email address would seem relatively low-risk, but giving your home address could open up a potential vulnerability. Also, take practical steps such as only meeting in a public place if you meet again. Holidays and festivals are perfect places for Synchronistic messages to reach us. With a break from our routine commitments, the pace of life can slow down and we mellow, relaxing and recharging our batteries. And maybe more time opens up for us to engage with others in a sense where we are more free with ourselves. In a holiday mood, we are maybe more open to chatting with strangers as we share the commonality of the holiday experience. And it’s uplifting to see other people laughing, smiling and enjoying themselves in the same shared space. Often on holidays complete strangers will become our new best friends, we may find ourselves joining new crowds of other holiday-makers/ festival-goers, and making important connections with people who go on to become lifelong friends. But no matter where our location is, if we all take courage in exploring Synchronicity, and engage with others politely and authentically, there’s no doubt that we can speed up our Conscious Evolution – and the information we each seek will be delivered quicker. We all have unique journeys, and require different answers, but I believe that combined, all our answers already exist out there in the minds of other humans—it’s just a matter of finding the right people. There is a goal that we’re all surely seeking in the Big Picture, which is to achieve Inner Peace on the inside and World Peace on the outside. And when we talk to others and share our positively-charged information, we find our truth and gradually answer all the issues which niggle at our soul. The bottom line is: You have to explore your situations fully to increase your flow of Synchronicity. 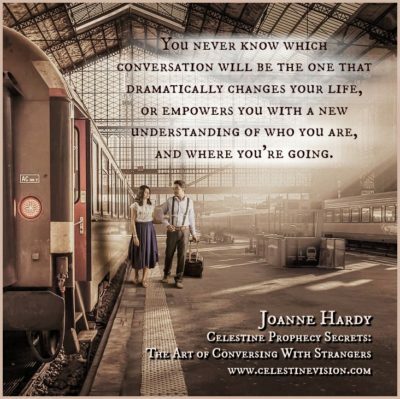 You never know which conversation will be the one that dramatically changes your life, or empowers you with a new understanding of who you are, and where you’re going. We’re each personally responsible for searching out our own answers. And as we piece our information together, and individually move into a blissful state of peaceful being, the vibrational level of our collective human consciousness is raised, and together we unlock the secrets that will set World Peace free. To receive information about upcoming Celestine initiatives please subscribe to our CV Newsletter.